A hermaphroditic species, the Ramshorn, loved/hated by aquarists worldwide. In an article on pond snails on your site, Bob Fenner mentions Red Australian snails. I've read about them in a couple of old aquarium books and I'd be interested in obtaining some, but I can find no information online. The illustrations and descriptions show them to be quite different from red ramshorns, which I already have. Do any of you have a few in a tank or pond? or know someone who does? Hello crew, thanks for this fantastic site. I have a quick question regarding my apple snails. I have 12 (Pomacea diffusa), most medium sized with a few being full grown and now 2 egg clutches just appeared. They are housed in a 20 gallon long tank, but due to the lowered water line, substrate, etc., the tank is only holding about 14 gallons of water. I have 2 power filters, one internal and one hang on back, with a combined filtration capacity of 300 gallons per hour. There is also a small sponge filter. The reason I am concerned is that I am having a hard time fully cycling this tank. I would really appreciate your opinion on this. Thanks so much. gravel where oxygenated water is to be found. 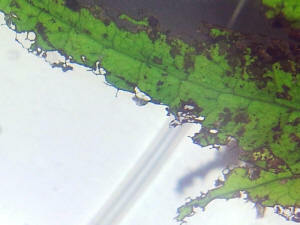 Gravel deeper than, say, 1 cm from the surface won't have many/any of the "good" bacteria we're after. Thank you for the considerate reply. I followed your suggestions and took some established media from one of my cycled tanks. At first I saw no improvement, so I upgraded my main filter to the next most powerful model of it's kind. Nitrite levels have decreased by about 75% since. I am using SeaChem stability with water changes and keeping a close eye on the filter, which consequently is running perfectly at this time. I just tested parameters in the apple snail tank, and although nitrites remain (0.50), nitrates are now my concern (almost 80 ppm). Is this a normal finding for the steps I have taken? <The snails were probably always there. You just never saw them. No, they don't materialise out of thin air, so yes, they have to get in there the usual ways, typically on aquarium plants. The easiest/best way to eliminate snails is a combination of physical removal (repeatedly, likely across many weeks) and the addition of some sort of predator. However, loaches tend to be more trouble than they're worth. For a start, you don't get "a" loach. The snails are almost finished devouring the plants. There's too many...it's too out of control. The plants were expensive and they're almost all gone. I've had two local fish shops recommend Skunk Botia to nix the snails and they have hard water too...though the one is selling water too so they have non hard water available. They're the smart shops...not just a chain store. One lady said they're perfectly ok in hard water. The guy I just spoke with (at the shop that also sells water) suggested skunk Botias are ok with Mollies, which actually implies they tolerate hard water based on Molly's sensitivity to soft! When I checked my facts online it looks like it's not so though....the skunk Botia looks like any other Botia in water preference..but these hard water folks say it's great for our water!!! You say you have hard water....do you know of people keeping skunk Botia in hard with any success (fish thriving)? Is it a flexible species? I think I definitely shouldn't keep it with Mollies. They like marine salt to thrive, a loach no no. I think I can get my water to 7.5 with mixing it like you said. I think that would probably be alright for a Botia.... Should I add peat filtration too? Do you know of anyone using this water system for filtration with success? I just thought....I wonder if there's something out there to filter water for tanks, and I checked online and there it is. How good is it, is the question?....$40 is inexpensive comparatively. Reverse osmosis not practical...it wastes too much and is too slow! Since I have the million snail thing going on........do you think the Botia could tolerate it if temporarily I put a whole bunch of fake plants in the tank? The guy suggested it would be easier to get rid of them if there were less food supply for them. However Botias like a heavily planted tank. And are known to be aggressive and territorial. I'm wondering if they'd tolerate fake plants..or is that an issue? In a 29 gallon what is a good ratio of females and males to keep with this species? He said 5 to 10 fish..... I'm ok if it's my only fish species. I can live with that. I just remember I understocked mollies and had issues and I wonder if 9 is best, or is it ok to start with 5 since the plants will be fake in the beginning? I want to make sure there are enough and not too many, if that makes sense. I really want living plants and the java fern was absolutely covered in baby snails last night even with adding the plant food and an increased light source. They look like java-lace-fern and there's not much more to eat on them!!! I attached a picture. They were $8.00 lg investments! I want my tank back and I am willing to work with the skunk Botias based on their reputation of being snail annilators! Wow....this is embarrassing. I had bought a replacement bulb a couple months ago and that's when the plants started to noticeably go down hill. The guy really sold the bulb, he had claimed it was SO much brighter and great for plants too, so he said. It was what HE uses. I should have known better. The bulb he enthusiastically sold to me is called actinic. it doesn't even grow coral! There is so much misinformation in this hobby. There should be a class for fish store employees because people will ask them questions and they will give out free advice. <Can't speak for where you live, but here in the UK, yes, there is college called Sparsholt College that has vocational courses on fish husbandry, including one aimed at retailers. It's been running for some 20 years now and is very well respected. There may well be others offering equally useful courses, and I agree with you, it'd be helpful if retailers made an effort to train their staff more fully. If nothing else, mis-selling equipment such that hobbyists end up with dead fish or plants pretty quickly dampens any enthusiasm. That in turn means such people leave the hobby, never to come back. Proper training means sales staff can nurture good aquarium practice in their customers, and long term, such customers will come back for more stuff over the many years they stay in the hobby. I had been totally sold against skunk Botia in spite of their supposed snail eating prowess, due to the negative things I'd read about their temperament. But then the LFS were selling it as a miracle cure to snails and downplaying what I'd read about it's aggression. As there were two LFS recommending it, they'd convinced me against my better judgment to get them. Thank you for confirming that it's a bad idea!!! I was ready to go and buy a bunch and it probably would have been a disaster. I wouldn't do a pea puffer either I don't think...but the lady at LFS recommended a pea puffer for snails instead when I'd told her I worried about skunk loach aggression, and she said it wouldn't bother other fish if I just got one. She said it's mouth was too small!!!! LOL! It sounded so cute I was tempted. But all the authorities say it occasionally does ok with Otocinclus (because they're bottom dwellers and they swim FAST enough to get away), but that it will attack larger fish and it ought to be in a species only tank. Also it's freshwater not brackish tolerant so I couldn't keep it with mollies. They guy at the other LFS actually told me I could just keep a school of pea puffers but that also disagrees with everything else I've read, as they fight each other once they mature. (His were young stock.) Anyway they're so small..... they probably wouldn't make much of a dent on millions of snails in the amount I could keep of them! I will buy a whole bunch of Indian fern and return the hideous plastic plants I purchased last night!!! I will also build up stock of fish again. I think I'll go all female this time, and I'll chose baby mollies about the same size as the two that I have now so they're equal. Hopefully I can balance the tank and with regular plant feedings and some supplemental light or a better bulb, the plants will grow again. I'll offer more vegetable to the fish so they don't live on flake and algae alone. Neale, ironically, I've had incredible success with java ferns in the Betta setup, and that's why I was freaking out that they were failing in the large tank...it seemed such a hardy and durable plant in the Betta setup. 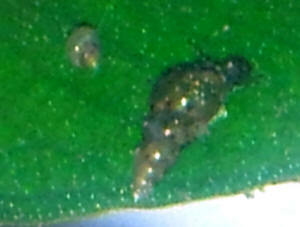 They do reproduce, hundreds of little off shoots which come loose and I stuff those into the java moss where they grow. They grow super slow of course, but predictably. <One issue its lighting. If overhead lighting is strong, red algae grows on the leaves (typically blue-black brush and hair algae, which are red algae despite the colour). Anyway, these algae are a sure sign that the Java Fern isn't in a good place. In the wild the Java Fern lives in shady places, usually above the waterline to be sure, but places like waterfalls in rainforests where the overhead light is filtered through trees and shrubs. I did think they looked inedible... I think I'd also read somewhere that a fish that nibbles plants won't eat them. I was therefore shocked that the snails were devouring it. So I suppose I have the notorious apple snails. Though....the javas in the big tank aren't reproducing. Maybe they are imposters!!! wow. That Anubias had more leaves. At least it's holding stable. I'll buy a ton of Indian fern.. hopefully I can find it. I'll feed it too. I suppose that was the issue too. My tank became sterile as plants died back and I had trouble with mollies bullying and they slowly died out. The guy I spoke with yesterday at one of the shops said he's found if he does a vegetable like zucchini twice a week it really helps to curb molly aggression. I tried squash to catch snails and while they ignored it....the mollies loved it. I think I'm struggling for lack of experience at this!!! I am going to try this cool home made snail trap today..... i think the shrimp pellets will be more enticing than lettuce or zucchini. I have a small plastic container. I hope I can thin their population somewhat. I thought horse faces get to 11" so I hadn't thought him an option, but I searched again today. I guess it needs a small group due to the species. I'll see if a LFS could order the dwarfs..... I like the look of them and they're a perfect size. Thanks again, Neale, enjoy your weekend. Both are written my former aquarium magazine editors with lots of fishkeeping experience, and both take pains to point out species you shouldn't keep as well as ones that should do well. If you're looking for used book bargains, both "An Essential Guide to Choosing Your Tropical Freshwater Fish" and "Interpet Guide to Community Fishes" cost pennies on Amazon and cover the basics well (indeed, the second book named was my very first aquarium book, bought in the early 80s!). I like the "Complete Aquarium" by Peter Scott as well, even though it takes the quirky approach of step-by-step descriptions of around 20 different types of tank (about six pages for each). Do try and look at this one, it's inspirational! Wow, I'd love to attend those classes! I suppose they have something in TX at College Station or maybe in a University near the coast, but it's likely more commercial and not for hobbyists. I'm studying real estate classes now, though I read a lot about fish in my spare time, and having some classes to help me better understand the chemical biology of tanks would be useful. Now I know the actinic is what caused the downward spiral with the plants. I'm mad at myself for letting myself be sold on that bulb in spite of misgivings, but I guess if I get a two bulb strip I can use it in the future beside a plant bulb. I appreciate your educated advice! Thank you, Neale, I'll try those books, the used book I started to read last night contained outdated info and I was wanting to find some reputable ones! The last book sounds like fun. I have a short book on biotopes that I love, and it sounds like that one's even more detailed about the different kinds of tanks. No one had Indian fern…. but soft hornwort was working reasonably well before the light bulb change, and it's popular locally. A guy's going to give me a huge bunch free this Friday as they throw it out at that shop anyway....it's just what their cherry shrimp are shipped in. (I'm hoping I'll find a tiny shrimp or two in it!) Other stores sell it and claim it grows like a weed. I ordered a bunch of Indian Fern from him also as no one carries it but the farthest away store who was out Saturday and needing to reorder… These plants will provide a quick planting replacement, the hornwort bridging the gap until the Indian fern grows larger. This way I don't have to spend a lot and I can rebuild my plant stock gradually. I may temporarily hook hornwort to decorations to simulate rooted plants... To give more hideaways. I'm sure the fish won't be picky. I'm up to 5 assassins..... I've been buying them weekly. It looks like a couple of them are growing larger...probably from the massive food supply. I guess it will best to wait till the new plants arrive next weekend to do a thorough clean and gravel switch, as I don't want it to get too sterile. I have a Quick Start too...whether or not that will be helpful remains to be seen. Thanks again. I'm going to hit up some garden stores now for fine gravel. It's cheaper to rinse it than pay all that money for the gourmet pet store variety. Though I saw some on sale claiming to already have the bacteria...... That is tempting and may be worth a little extra cost. But Quick Start was $3 and claims to be the bacteria needed. I could probably soak a little of the gravel in it and add it that way to make sure it takes as opposed to just dumping it into the water. Thanks Neale. Yes, it's called Water Sprite here, and I used the Latin name too when asking around. The chains used to carry it I think, ages ago, but they all went to small packaged plants...only one chain store still has a plant tank except for the specialty stores....and they all carry limited stock in their plant tanks, planted in gravel not substrate, with a few fish and apparently lots of tiny snails and every kind of algae imaginable! That's why I like the ones packaged in moisture beads that are clean! They also have the Latin name. The only fern they carry is Peacock and it isn't the same Latin name. <Ah no. This isn't even an aquatic plant; a species called Selaginella willdenowii that inevitably dies underwater. 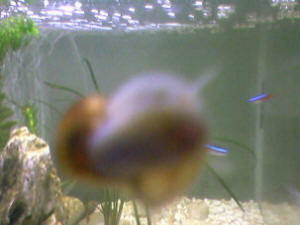 Here are some mug shots of the snails. If you don't really look you might not know they're there. The one on the java is dead center and harder to spot. I use a paper towel to wipe-capture as many as I can from the glass but some still fall back into the gravel so restarting is the best option. Thank you again! I'll take your advise and see if I can save this tank. I guess if it works, thinking very optimistically, I'll need to drop live food occasionally for the assassins? Maybe a little live food is ok for Mollies even though they're primarily vegetarian. My daughter brought home a pond snail from school that was raised in our math & science center. Can we introduce this snail to our established freshwater aquarium? Even though our aquarium is not heated, it is keep at room temp. Hi, I have been looking for freshwater Neritidae snails. Can you please tell me if you handle them or where to get them? Also, in the information that I have been able to find about them, some say that they will not multiply and others that they will. Which is right? <Greetings. Where to buy them depends on where you are. Here in England they're quite widely sold in the bigger aquarium shops, such as the Maidenhead Aquatics chain. Asking your local tropical fish shop to get them in shouldn't be hard, but note that some retailers haven't a clue what these snails are properly called, so it may take some effort to connect the common names on his wholesaler's list with the Latin names of the species you want to buy. As for reproduction, most do not breed in aquaria. They certainly will lay eggs, but the larvae are planktonic and in many cases float into the sea to develop, and only return to freshwater later on. We bought a very lovely Apple snail, Carl, who was about an inch in diameter. He seemed to be thriving for about a year and a half. He was mobile and active a lot of the time and did a great job cleaning algae and I suppose any food debris. I also made available to him (her?) the algae pellets every few days or so and he also liked the shrimp pellets. Then one morning, he was dead. No signs of trauma. Just dead. I checked the usual suspects (temp, chemistry, etc) and nothing was out of whack. I then read that the life of Apple snails is shortened by keeping them in a common aquarium temp of 73 degrees. So even though I wanted to immediately replace Carl, I didn't think it would be right to knowingly place a snail in an environment that would shorten his life. Is there a non-pest snail whose life is not shortened in a 73 degree tank? 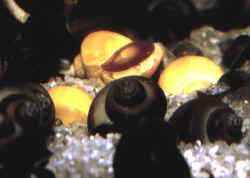 <Oh, you could try some of the Nerite snails. They come from tropical streams so do well slightly on the cool side provided the water is briskly moving and has plenty of oxygen. Because they eat ONLY algae, they will starve if the aquarium is too small, so allow one large specimen (about 2 cm long) or two smaller ones (1 cm long) per 10-15 US gallons. They need moderately hard to hard water, and won't live long in acidic conditions. I have two questions. I have a Red Ramshorn Snail I bought about five hours ago. At first, he was coming out of his shell a little bit. I put him in my four gallon tank with my Betta and now he doesn't come out. My Betta hasn't touched him as I've been monitoring the tank. First time I put him in I accidentally dropped him but he landed on my plant, so I don't think he got hurt? His shell seems to be fine. He is defecating at the moment. What's wrong with the little man? 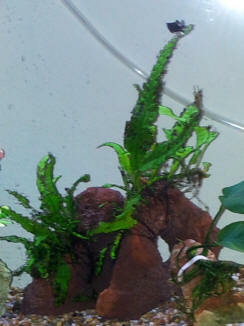 Also, my Java Fern looks like it has a white cottony- growth all over the leaves and the roots. I was told to just wash it but I can't get it all off. It's not dying as there are other little plants growing on it. I thought it may of been the oxygen shell that was in my tank as the growths first started on the plants roots. I threw out the oxygen shell. Is the plants problem connected to the snail problem? How can I solve both? Any information will be greatly appreciated. Also, my tank is not filtered or have a heater. It's just plain freshwater with water conditioner. I also replace 10% of the water every few days with new, conditioned water. I got the Betta as a present from somebody in a brandy glass. I knew that this is an improper home for him so I got him the larger tank as soon as I could. It is a round bowl as that is all I could afford unfortunately. I haven't been able to find any filtration, pumps, heaters or lights that can fit or a suitable for my tank. I've searched many pet shops, aquarium specialists, I've asked people and I've looked on many websites including eBay but I've had no luck. I plan to get a rectangular tank and all these things as soon as I can but I don't know how long this is going to take as I am a full time student, not working and living on my own. So is there anything apart from all the above mentioned that I can do? Also, my snail has moved as its fairly far away from where I originally put him (from on top a leaf on the plant to close to a rock, he's also the right way up, foot touching the ground). My Betta seems curious, he stares at the snail and sleeps right next to him. He doesn't flare up at him or look agitated or aggressive, he just simply stays next to him. Would this be a good indication that my Betta is OK with the snail? Hello crew I am very confused... I have always wanted snails. I have researches them allot and know what they need well kind of. black. The other two where called golden Inca snails. Well I wasn't satisfied I wanted more than just three. So I traveled about an hour to another pet shop. They had a whole bunch so I got 2 blackish mystery snails and one that was called ivory mystery snail and a golden mystery snail also a blue mystery snail. Well I am happy with all of them but I want them to breed but I don't know what species they are so I don't know if they will. So what are the difference between these snails and will they breed together? Greetings - thanks for the advice below. I successfully cleaned all the components of the 55 gallon aquarium with vinegar and it worked quite well. I hope to start the tank this weekend and move the fish in 6 weeks. My follow-up question has to do with snails in the aquarium. At the beginning of the pond season I purchased 10 Japanese trap door snails. I think they have done very well and are about 1 1/2' in size. How many of these snails should be brought in to place in the 55 gallon aquarium with the 3 fish. If none of the snails should go in can I keep them in a separate aquarium so they can go back in the pond next Spring? I put about a tablespoon of aquarium salt per 5 gallons. If not, what small algae eating fish does well in brackish conditions? I went to my LFS and they didn't have any of the Nerite snails... They just had "mystery snails." I was told that they ate algae, but they were just sitting on the bottom. I could add more salt and keep looking for those snails. Just wondering: do Oto cats tolerate that? I know they can be very picky when it comes to water parameters... What do you think is best? Also, I was told that the Nerites were hard to find ??? Is that true? Sorry for throwing all these questions at you. Thank you Merritt, and just curious (not disagreeing, just learning) why do feel I need at least 11/2 inch of sand in the back? I've looked over all the FAQ pages, and I haven't quite found what I'm looking for, so I resort to asking you. I have a 75g reef tank as well as a 30g freshwater tank. 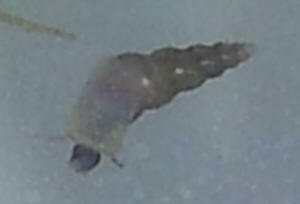 I've noticed over the past few weeks that I have dozens of what appear to be Cerith snails in my freshwater tank. The tank has been established for several years, with nothing being added in the past 2 years but fish. I've let all of the ornamental fish complete their lifecycles, and I only have one Pleco and a few feeder fish for my fuzzy lion (I'm weaning him off successfully, but he's taking his time). I've had a ton of Cerith eggs in my reef tank, is it possible that they hitchhiked on the net while in the plankton stage, and developed in my fw tank? I can't think of any other place they could come from. Snails Lots of snails 9/28/05 Hello! Your site has been helping me the site has been helping me a lot with my current aquarium "experiment". Thanks for the time and effort spent doing this. <It is for you...> To explain a little bit about my experiment: I have kept several community tanks during my life and even a 20 gal reef tank at the age of 12 through 15 that died abruptly when my little sis' decided that pennies would be a good decoration. <Yikes... not good luck> Recently I have taken a fancy to the idea of a more beautiful looking tank. To achieve this I wanted to go small and heavily planted 5 gal. 20+ plants. I am using a pH monitored CO2 system and a 4x overdriven 8 watt T5 5500K light. (by the way it needs to be trimmed at the very least once a week.) <I see> I have: 2x Otocinclus mariae 3x Aphyosemion australe 1m 2f 10x Caridina serrata (cherry red shrimp) <Very nice> I also have (uninvited): at last count, 450 baby Ramshorns and pond snails. I skipped the dip thinking that nothing bad could happen. <Uhhh> So I have built a snail trap with a 35mm film canister I bait it with blanched zucchini and pull out around 35 - 40 snails over the course of a day. The holes to the trap are too small for the Otos and they sit staring at the canister all day like the cat stares at the tank. <Heeeee!> Now for the real questions: My snail removal plan is to remove any and all adult snails. I thank that part is done now. And then to keep trapping for the babies until they are gone. I would like to know at what size these snails reach maturity and start reproducing, so that I can remove those (mature ones) by hand as soon as I see them. <Am guessing, but likely about the size of your fingernails...> Also: After I get this mess cleared up I am interested in introducing Melanoides tuberculata, (Malaysian Trumpet snail) as a soil maintainer. <A wonderful animal... but... just as improbable to remove...> I am worried about their prolifictivity. <Neat word!> I was planning on baiting for the young of these once a week once they are established. Would that be too often or am I risking another population explosion? <As burrowing animals... Might I suggest a change in your experimental stocking? To Mystery Snails... easier to control population-wise... Bob Fenner> Thank you much for any help.